The Catholic Church in Chicago: 1673-1871, An Historical Sketch, Gilbert J. Garraghan, S.J., Loyola University Press, 1921, Chicago, IL. 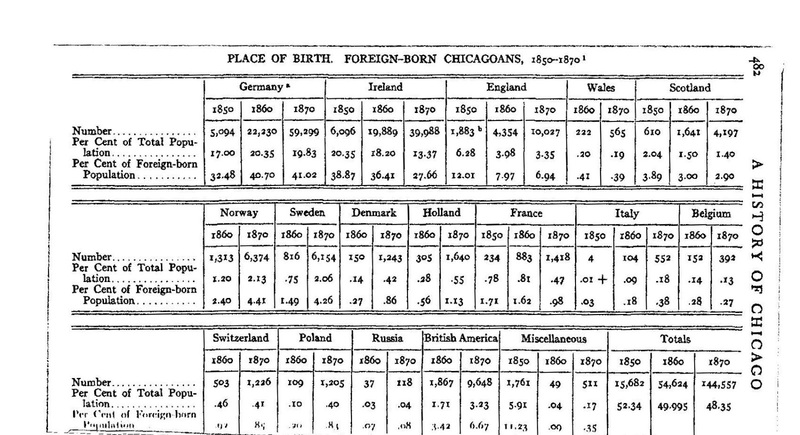 One Hundred Years of Land Values in Chicago: The Relationship of the Growth of Chicago to the Rise of its Land Values, 1830-1933, Homer Hoyt, The University of Chicago, 1933, Chicago, reprinted by Beard Books, Washington D.C., 2000. Chicago’s First Half Century, The City as it was Fifty Years Ago and as it is Today, The Inter Ocean Publishing Company, 1883, Chicago, Illinois. Both Pierce’s and Andreas’ books are well-researched, greatly detailed histories in three volumes each where one learns about how the city came to be and how it developed. The chronology of the Catholic Church in Chicago by Father Garraghan gives an unexpected concurrent history of the city that petitioned for and supported the Church. 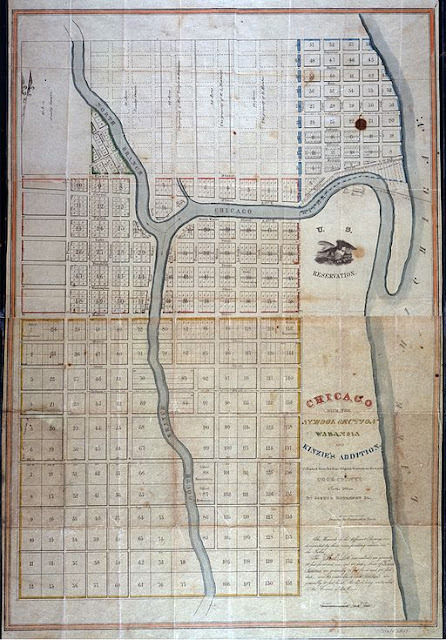 The fourth book by Hoyt is a history of the ups and downs of land values in Chicago which parallels the movement of the people within this great city. The fifth source was published by the Inter Ocean Publishing Company in 1883. 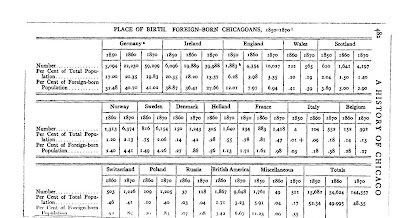 Although it has a slight flavor of a chamber of commerce piece with advertising included, it also provides a good introduction to life in nineteenth century Chicago and a detailed look at early industries. to Water-Way Systems", Hoyt, p. 8. 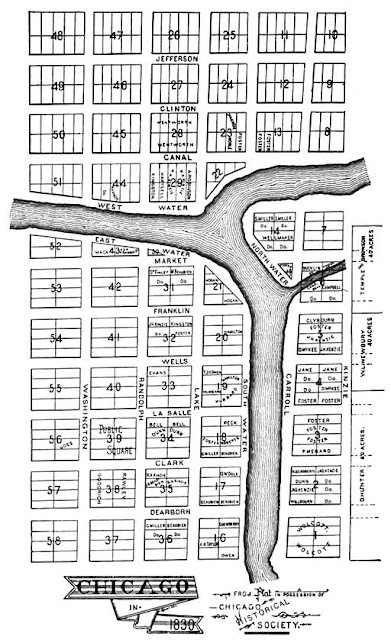 This is where Chicago began. But for a visual representation of the early city, we have a painting by Edgar Spier Cameron. Company, Chicago, 1910. p. 11. But as the population grew, the first building could no longer hold all the congregants. St. Mary’s moved to a larger space. 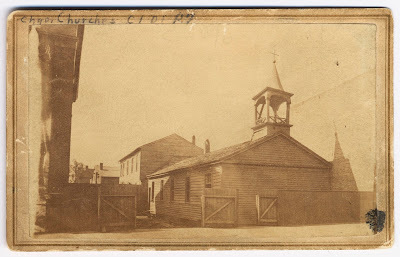 Below is a photograph of St. Mary’s “in its third and last location, on the south side of Madison Street between Wabash Avenue and State Street.” p. 82. 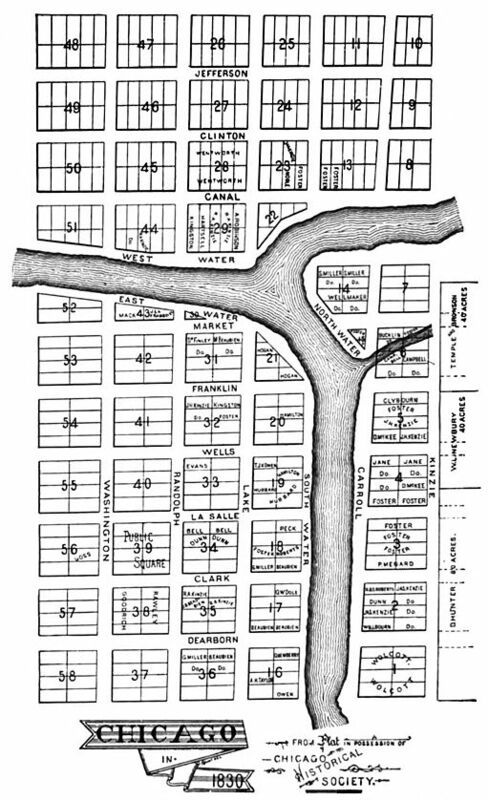 Thus from the commercial and religious building in early Chicago, we can chart the growth of the city from its meager beginnings. No one who knows the city of today could imagine how it started one hundred and eighty-four years ago. Those early pioneers had great imagination, fortitude, raw energy, and steadfastness to risk all in such a wild and swampy prairie. With what amazement would they now behold Chicago in the twenty-first century. 5 History of St. Peter’s Church, Chicago, Illinois, Franciscans, Province of the Sacred Heart, Chicago, 1953, p. 32.